Okay, something interesting is going on in DX. We have had four different 24mp DSLRs from Nikon without the same exact sensor sitting behind the lens. Particularly interesting is the D5200 to D5300 change, because you have to look really hard to see any difference. The sensor markings look Sonyish, but the packaging is new and different than either the Sony or the Toshiba 24mp sensors we’ve seen so far, the AA filter has been removed ala the D7100, and get this: Nikon has finally changed their definition of black. The measurbators will find some other changes, too, some of which seem to indicate that the Bayer filtration has been modified again. I can come up with theories, but since Nikon’s not talking, we won’t be able to lock down the answer. You’d think that with the entire DX lineup being 24mp cameras now that there would be a cost advantage to sourcing all the sensors the same, but I’m starting to wonder if the volume of APS/DX sensors being used is stressing production, and Nikon is just being opportunistic as a result of that. Or they could be experimenting. Or…well, who knows? I’ll talk about how the changes impact a few very subtle things in the performance section, but here’s the short answer: nothing’s changed enough to get excited or stressed about. The D5300 popped out early, too, which is another mystery. The lower end DSLR (currently the D3200) had been the one iterating the fastest, with one year being the quickest turn, but all of the sudden we have the D5300 a year after the D5200 while the D3200 is now a whopping 18 months old. So what changed in the D5300 over the D5200 besides the mystery sensor swap? EXPEED was updated to 4 from 3. In other words, the black box even deeper under the secrecy covers than the sensor is newer. Part of that (plus maybe the sensor change) gives us 1080P/60 instead of 1080i/60 on the video side, plus supposedly slightly cleaner results after compression. The D5300 gets a bigger LCD (3.2” versus 3”) and picks up a few extra dots (1.04m versus 921k) in the process. Same basic technology, though. Surprisingly, despite the bigger LCD Nikon has trimmed a millimeter here and there and reduced the weight by almost an ounce (16.9 versus 17.8, or 480g versus 505g for my metric-loving friends). Somehow the CIPA shots per charge also went up from 500 to 600, probably because the battery is now a slightly more hefty EN-EL14a. Built-in WiFi and GPS are the biggest news (and turning them on will eat that gain in shots per charge back up). 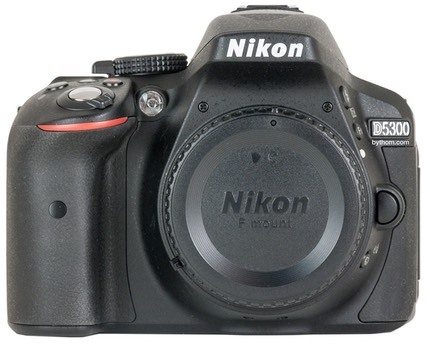 The D5300 was introduced on October 17th, 2013 and shipped later that month. The camera is made in Thailand. 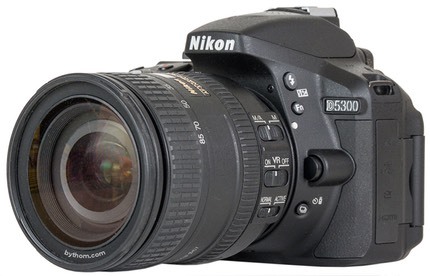 The D5300 is the fourth in the series of intermediate consumer DSLRs from Nikon, with the D5000, D5100, and D5200 preceding it. The key defining element of the D5xxx series has been the swivel LCD, and that remains with the D5300. 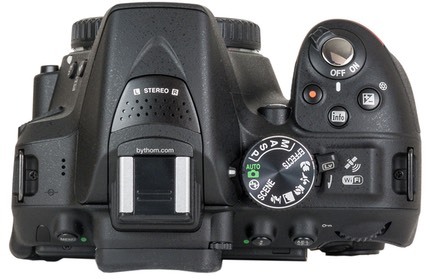 The D5300 uses SD cards and has a side door that reveals one SD card slot. Options for the camera are fewer due to all the built-in electronics, but there are still wireless remotes you might want to explore. Overall, the D5300 has pretty much everything you'd expect from a mid-range DSLR, including built-in sensor cleaning, LiveView, Quiet Mode, intervalometer, and more. If you're interested in the full list of specifications, check out my data page for the D5300. Some folk are puzzled by Nikon's actions with the consumer DSLRs. As I've written elsewhere, a rule of thumb is that the middle model of three—in this case D3200, D5300, and D7100—is the one the manufacturer always wants you to buy, because that model tends to have the highest gross profit margin. Typically, the manufacturer will throw in some features that make the model stand out slightly—in this case the swivel LCD—so that those considering either flanking model might be tempted to buy the middle model. The D3200 is US$600 list with kit lens, the D5300 is an implied US$900 list with the same lens. Thus, you pay US$300 more, but parts wise the only real differentials are a GPS chip, a WiFi chip, and the swivel LCD. In manufacturing costs, those aren't a big change, thus, the D5300 clearly would have a higher profit margin than the D3200 (though not if you bought the optional WiFi and GPS modules with the D3200; sneaky, sneaky.) Going the other way we can do a direct body-to-body comparison: the D5300 is US$800, the D7100 is US$1200. Only a few parts are getting upgraded in the higher-end camera, with the AF sensor, metering sensor, extra controls (which increase assembly cost), dual card slots, and a few other odds and ends being the primary difference, though the menu system reveals more features in the firmware. In Nikon's current DX case, my guess is that Nikon gets a better profit margin each time you step up in their line. Still, these cameras are all 24mp now with sensors very similar in performance. The D5300 probably is the sweet spot in the lineup, especially if you value the GPS and WiFi additions. The one thing every D5300 purchaser needs to remember, though, is that it has no support for lenses without focus motors. That means that autofocus only works with AF-S (Nikon), HSM (Sigma), or Tamron and Tokina lenses that specifically say they have a built-in focus motor. Older AI and AI-S lenses (manual focus era) won't meter on the D5300, though you can mount pre-AI lenses on the camera without damaging it. To get all those things, you need to step up to a D7100. For the most part: just like the D5100 and D5200 before it. Users of traditional Nikon DSLRs will feel mostly at home, though there is a lack of buttons overall, only a Rear Command dial, and all the buttons on the back of the camera except one are arrayed to the right. Having used a lot of mirrorless cameras lately (for the sansmirror.com site), I've gotten used to a lot of touch screens. Frankly, the D5300 needs one (I wrote that about the D5200, too, and the Canon 5Ti that competes against the D5300 has one). Indeed, the whole Shooting Information display notion works better with cameras that have touch screens than ones where you have to continually tap on buttons or the Direction pad to make a choice. The Nikon sequence is Info, Info, Direction pad to item, OK button, Direction pad to choice, OK button. That sometimes leads to sequences of eight, nine, ten presses to set something. Contrast that to a touch screen: touch for info, touch item to change, touch choice. Three presses for pretty much anything. While there's nothing particularly bad about the Nikon shortcut system (you can also set most things through the menu system, but that might be many more presses for some items buried deeply in the long menus). However, it's starting to feel antiquated. For the class of users typically considering the D5300, touch screens are something they're highly familiar with now. Most users of a camera of this level will miss having no buttons that control ISO, white balance, metering, or AF mode. You can program the Fn button to perform ISO or white balance, but that's likely to be one button short of what most user want. If you're always setting the same thing (e.g. white balance), leaving the Shooting Information display highlight on that means that you can get to it via: Info, Info, OK, navigate to selection, OK. That's not a good enough shortcut, in my opinion. Maybe it was when the system was designed, but competitors with less expensive cameras have done a better job with their touch systems, so I can't give Nikon's system a straight pass anymore. That's a problem in high tech. What got you an A a couple of years ago merits only a C today. It does not feel like Nikon is moving forward fast enough with a number of things, mostly centered on the user experience. Don't get me wrong, I fully appreciate the historical legacy of allowing a trained Nikon user to continue to do the same thing on a new camera, and I'm not asking Nikon to abandon that. Nikon doesn't need to take that off the current models; they instead need to add newer and slicker ways of getting to the same result faster, as their competitors are certainly doing. Given how many things we have to control on a sophisticated camera such as the D5300, we want faster access, not just the same old slow access. I've mentioned the Shooting Information display several times already: it's been refined and is a little clearer, though still has that gimmicky look for many simple things (like aperture and shutter speed). Unfortunately, there's no eye sensor in the D5300, so we're back to the old on/off with the half press of the shutter release again, which can be highly distracting. You can, however, just turn the LCD around so that it isn't visible to remove that distraction, but then you don't have quick access to things via the Shooting Information display! Taketh, giveth; a nearly constant in Nikon's incessant tweaking of designs that weren't broken. The Automatic ISO program fortunately, did move forward. It's basically the same as in the D800, which is about as sophisticated as Nikon or anyone else has done to date, and useful. Live View is invoked by a lever underneath the Mode dial, not the new control we've seen on the D600, D800, and D4. The Mode dial itself has the usual lower end emphasis on Scenes and Effects, and does not have custom positions on it like the D7000 or D7100 do (i.e. no U1 and U2 position). Plus Live View is the old "no changing aperture while active" problem that all the low end Nikon DSLRs have; they just don't have the part necessary to do real-time live view aperture changing. It's a cost cutting measure that unfortunately has a real impact on some users, and certainly makes video use not quite as good as it should be, too. Nikon's figured out the IR remote control thing: we get both front and back receivers. If that's not enough, a new wireless remote system was launched with the D5200 and that works with the D5300, as well. Not all is improved, though. The "drive" control that sets single frame, continuous, self timer, and remote has moved. The drive control now becomes a button on the front of the camera where the focus control usually is on Nikon bodies. Focus control, as with the D5200, is via the menus or quick settings accessible via the Info button. One big issue for some is going to be the buffer: it isn't big enough. Shooting raw (14-bit compressed NEF) you'll hit the buffer limit in a bit more than a second, possibly less if you've got some advanced features turned on. You can extend that to a bit over two seconds by dropping to 12-bit compressed files. JPEG shooters, of course, don't have that problem as the camera will shoot for 100 shots in any JPEG mode other than Fine with an UHS-I card (35 shots with JPEG Fine). It seems that Nikon is now really targeting JPEG shooters with their consumer DSLRs. We're in that realm now where the pieces of the puzzle don't quite add up right. The 24mp sensor is big. We're talking 20" prints at native print resolutions without any resizing. But is 8-bit compressed JPEG really what you want to create 20" prints with? We're at the point similar to where we would be if we put large cylinder V8 engines in all cars but then put limiters and enforced acceleration and cruise controls, plus other limitations in place just to get better gas mileage. Why not have an appropriate-sized engine in the first place? All that said, the D5300 still handles like a Nikon DSLR for the most part. A Nikon user will find their way around fast enough, even though button positions keep changing model to model. We do have less menu dance—where things move around from where they were on another camera—than usual, though. Although the camera is mostly polycarbonate and in a few places feels a bit hollow (tap around on the plastic, you'll see what I mean), it also has a bit of a sturdy, simple approach to controls. There aren't any levers or edges that stick out; everything is nicely tooled into protective positions and the Direction pad actually feels a bit sturdier than it does on a few Nikon bodies. In some cases Nikon has even put in some subtle touches. For example, the Delete button is recessed with a slight ridge surrounding it; it's not going to get accidentally pressed despite its relatively insecure position. Battery — I'm not a fan of the EN-EL14, now in an "a" version. It's somewhat above half the capacity of the EN-EL15 used in the higher specified cameras. With the swivel LCD there's more temptation to use Live View on the D5300. The fact that you use either the Shooting Information display or the menus via the LCD to set most things like WB and ISO means you're dipping into the power-hungry LCD more often, too. It seems clear that Nikon picked the battery because they felt that the D5300 user was a "casual" user and not one to be taking hundreds of photos a day. That shows in the performance of the battery. The CIPA number is 600 shots. I find that I'm a little under that mark in my general shooting with the camera. Not a terrible thing to be able to take 500+ shots or so per charge, but still, it means that if I'm truly out shooting all day I need to carry two batteries. Video users, well, carry plenty of batteries. The run-down timings I'm getting are still in the 90 minute range. Oh, and watch your WiFi and GPS use. Those two functions start really cutting into battery life. Indeed, you'll tend to want to set the camera to a longer "meter active" time than the default so that the GPS stays locked as you move about and doesn't have to reestablish a position, so the battery hit is serious. Change that two batteries for a really full day's shooting to three or four. Writing to Card — This turns out to be something you want to pay attention to. The basic buffer is 35 shots in JPEG Fine Large, 8 in NEF. If you don't have a UHS-I capable SD card capable of high speed, you're going to be waiting for the buffer to clear on almost any continuous shoot when set to raw. Again it brings up the "why do we need 24mp if we're compromising image quality via compression" question. Older, slower cards definitely put more limitations on the buffer when you fill it—I've got one three year old card that took at least three times the time to clear the buffer versus a state-of-the-art card. Autofocus — No real complaints here. If you're coming from one of the 3 or 11-sensor Nikon DSLRs, the 39-point system will seem luxurious, competent, and complex. With AF-S lenses other than the low-end kit lenses (which use a lesser motor), focus performance can be quite snappy, even on moving subjects. Tracking is a little less capable than the high-end cameras with faster CPUs, more AF sensors, and more metering information, but the D5300 is still amongst the best of the affordable DSLRs in terms of AF performance that Nikon has made. Basically, Nikon has brought their previous high-end consumer DX AF performance down to the mid-range camera. If there's any drawback to the system its that it can't be AF Fine Tuned. You're stuck with how well the factory in Thailand got the calibration dialed in and how well your lenses are up to spec. I've got one lens that needs +10 AF Fine Tune on most of my bodies, and that means it just doesn't have a lot of acuity on the D5300 if I don't manually tweak focus. On the other hand, my big 400mm f/2.8 has never need AF Fine Tune on any camera, and it snaps in just nicely on my D5300. Video autofocus is still the same old slow hunt. It's reasonable for static or nearly static subjects, but if the subject is moving much, or if you're moving the camera, it's not reliable. I don't see any change from previous models here. Virtually every camcorder out-focuses the Nikon video modes on DSLRs these days, and the D5300 is no exception. Metering — Same old tricks: too much reliance upon the tonality underneath the current AF sensor, which makes the exposures seem a little inconsistent on the D5300 taken in the same light. Get focus on something dark and the exposure will be a little hot; get focus on something bright and the exposure will be a little dark. Easily enough compensating for and dealt with, but still, I just don't understand this bias Nikon has put into the system; it tends to make the matrix portion of the metering system—which is as good as there is—underperform more than it should. Image Quality — We've now seen four different 24mp sensors from Nikon in the DX DSLR lineup. The one in the D5300 has a different packaging than either the Sony or the Toshiba sensors we've seen before, but the data paths to the pins seem more Sony-like than Toshiba-like. Either Sony's got a new packaging process, or this sensor was fabbed by someone else using what looks to be Sony chip details. It really doesn't matter much, as the sensor is performing as well, if not better, than the other 24mp DX sensors Nikon has used (I see less deep low level banding than the Toshiba sensors, for example). There's one interesting change: black has moved! In every Nikon DSLR previously, black has been defined as being at 0. For the D5300, it's defined at 600 (14-bit values). This is something new. Centering black at 0 kills half of the standard deviation of noise in black (noise values below actual black still show up as 0). Centering black at 600 means that noise on either side of the actual value shows up in a normal bell curve centered on the 600 value. For most shooters this has absolutely no consequence to note. For astrophotographers that stack images to remove noise, it does. That said, I found no real changes that affect image quality in normal shooting. About the only thing I can point to is that when I bring up shadows by more than four stops I see a bit less pattern in the data than with the D5200, but not enough difference to try to demonstrate. Video — Surprisingly good video from a low-end consumer DSLR. Other than too much rolling shutter, video output from the D5300 looks remarkably good at the high bit-rate settings. Too bad Nikon isn't giving us a fully manual control for video, though. Should You Get a D5300? Let me turn that around: for whom would a D5300 be a step forward? Still the same answer as with the D5200: D40, D40x, D50, D60, D70/D70s, D80, D3000, D3100, and D5000 users are obvious choices. It's really a no-brainer for those folks, as the D5300 is a pretty marked step forward for all of them. It's tougher for the D5100 users, but I'd still tend to say that it's an upgrade worth considering only if you really have a use for 24mp. 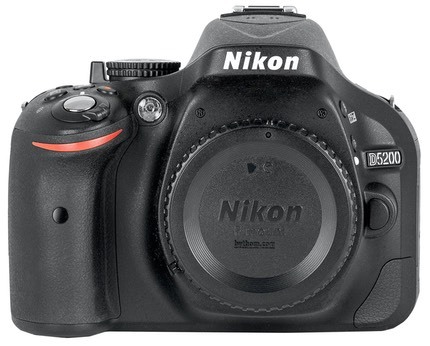 For D3200 or D5200 users, you'd just be switching 24mp horses. If you have these last two cameras, wait a generation if you want meaningful differences. The usual question I get for this type of camera is “Canon or Nikon?” Canon’s closest equivalent is probably the T5i, and it’s mostly a case of where one camera has something the other doesn’t, but you just wish both of them had everything. At the level we’re at now with these cameras, even the 24mp (D5300) versus 18mp (T5i) difference is mostly ignorable. I’d say that you should be looking beyond the feature sheets to select between them. Two things in particular would push my choice one way or the other: (1) lenses; if one system has the lenses you’re likely to want and the other doesn’t, that’s a big swing for me; but much more important (2) how do you react to the user interface of the bodies? Nikon and Canon have similar but very different in-hand approaches to setting controls, and the T5i has a touchscreen to set things, as well. If you’re more comfortable holding and changing things on one camera versus the other, I’d say you have your choice: if you’re not comfortable you don’t shoot, or worse still, you’re still fiddling when you should have made the shot. Don’t get bogged down in counts of anything (pixels, frame rates, sizes, AF sensors, you name it). Get bogged down in whether you’ll actually like handling and shooting with the camera. That said, the D5300 ups the game with the WiFi and GPS, assuming those are things you’ll use. This is the first time Nikon has gotten around to building those things into a DSLR as opposed to selling external accessories, and it’ll save you some bucks and frustration if you actually want those technologies. Nikon’s external WU-1a WiFi widget and GP-1 GPS unit would set you back a couple hundred bucks and add things poking out of your camera that you’d certainly bump. One final comment. The D5300 once again introduced some communication at the lens mount that caught Sigma by surprise. Nikon has pretty much made small tweaks to mount communications (lens and flash) with virtually every new generation of cameras, but this is the first time in awhile that a broad stroke of lenses suddenly had troubles. Sigma, to their credit, is offering firmware updates to D5300 owners for their lenses where possible. And Sigma lenses that are “dock compatible” are easy enough for the user to update themselves. But it’s one of those little things that raise your eyebrow a bit. Nikon just doesn’t acknowledge that anyone else is making things you might use with their cameras. They disclaim all suitability for use the minute you do stick any third party product on their cameras. Completely. They don’t even want to look at the problem. No doubt that sleuthing issues with third party products isn’t simple, and both sides often point fingers at each other while the customer frets in the middle. But Nikon starts by pointing their finger, and has no other response. Ever. This is becoming more and more worrisome to me as we see others encouraging third parties to work with their lens mount (e.g. the m4/3 partners, Fujifilm, and Sony). Nikon needs to be careful or they’ll get what they want and then discover that’s not what they really want. Especially with these DX cameras, Nikon simply doesn’t make a lot of the lens solutions that its users want. We have to look to third parties to fill the lens lineup in our bag. If you were a lens maker, who would you want to develop lenses for? The company that helps you understand their mount (Fujifilm, Olympus, Panasonic, Sony) or the company that says that if you can’t perfectly reverse engineer it, it’s your problem? DX Lens Choice. Nikon has not made a lot of DX lenses that will really still shine with 24mp at the back wall. With telephoto you can always dip into Nikon's large stable of FX telephoto lenses, but at the wide end, make sure the lens you need exists. One of the best third party options, Sigma, is having compatibility issues with the D5300, at least temporarily. Battery Chewers Inside. Leaving the WiFi or GPS on definitely cuts down the battery life. Slightly Better. Whatever the mystery sensor, the small changes are all going to give you ever so slightly better results than the D5200. Most will see the slight increase in edge acuity due to the AA removal; most will never see the slight change in color fidelity or noise patterns unless they push the heck out of the data, and even then, maybe not. Right Price. The intersection of performance, features, and price is just about right for most folk. The things you get above the D3200 are worth the difference, I think.